When I’m not working, you could find me … spending time with friends! I’m the Martha Stewart of my group of friends, so I am always planning/hosting events for us. Dealing with reactive messaging is always a challenge. Time is usually not a luxury in those situations, and it becomes easy to make mistakes. When dealing with reactive messaging you really have to step back and not let yourself get caught up in the rush. Make sure you are sending a message that addresses the issues as clearly and correctly as possible, while at the same time knowing you don’t have time to reach perfection. Anytime you can look at your work and know not only is it great work, but it was effective in driving results – those are the moments I am most proud of what I do. Honesty is always the best policy – when you have bad news, don’t wait and let yourself get into a reactive situation; be proactive with your messaging. When I was in college I remember responding well to Peter Elbow’s “Writing Without Teachers.” Also, the AP Stylebook is a must, and if I have a question that cannot be answered by the stylebook, I visit the New York Times or Grammar Girl websites. Making connections with other professionals in my field and learning from them. 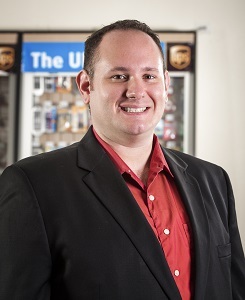 Current Job: Communications Specialist – The UPS Store, Inc. Vendor Relations Marketing Coordinator – The UPS Store, Inc.